G. Keith Crittenden was born in 1934 in Kalamazoo, MI. He graduated from Michigan State University in 1956 with a degree in floriculture and was hired by Norm Kessel Florist as a designer. His next job was at Van Bochove Flowers in Kalamazoo as a delivery boy at $50 a week. He soon worked up to designer, which paid at the time, $100 per week. His career path then took him to Gordon Lamberts, a wholesaler of artificial flowers and gifts in Grand Rapids. This is where he met the Hannah’s and purchased the Hannah Floral Co. in 1968. He operated it for thirteen years before selling to the Holwerda’s. 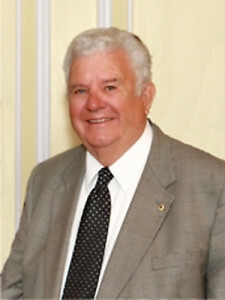 During the Hannah Floral Co. years Mr. Crittenden served as a Regional Director on the Michigan Floral Association Board, as well as President of the MI Unit of Teleflora. Looking for a new opportunity, he joined the A.L. Randall Co. Adding other companies, he traveled the states of Michigan and Ohio for the next fifteen years as an independent sales representative to the floral industry. Mr. Crittenden has been officially retired since 1997 and currently resides in Michigan and Florida.